My article on Mizuho Nishikubo’s Musashi: The Dream of the Last Samurai, is online now at the Manga UK blog. 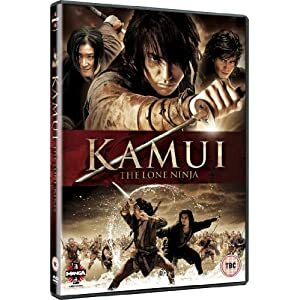 With a gruelling shoot that spanned April 2007 to September 2008 after its leading man’s injury on set, filmed in the sub-tropical heat of Japan’s idyllic Ryukyu island chain, Kamui: The Lone Ninja recreates a lost world of fishing villages on the Inland Sea, a time when the samurai wars were done, and the people of Japan returned to their fields and their boats. It also evokes a savage era where all unwelcome influences were ruthlessly suppressed, and plays with the notion that the Japanese peasantry of the 17th century had formed secret societies of semi-magical assassins. The son of a renowned left-wing artist, Kamui’s creator Sanpei Shirato (1932- ) was one of the last of the kamishibai painters, making panels of artwork for Japanese “magic lantern” shows. A narrator, or benshi, would tell a lively story to a crowd while pushing pictures through a lit frame. Soon after Shirato’s first kamishibai work, Mister Tomochan (1951), the advent of television destroyed the medium, leading Shirato to transfer his skills into comics. His early work included adaptations of the animal stories of Ernest Seton and works for girls, but it was as the creator of Ninja Bugeicho (Chronicle of a Ninja’s Martial Achievements, 1959-1962) that he achieved true fame. Even in his early days, Shirato was notable for his insistence on an external narrator, a voice outside the story itself that would comment on the action and steer the viewers like an old fashioned benshi. One casualty of Japanese warfare [in the 9th century AD] was the ?yumi or crossbow. Seemingly imported from China, the crossbow existed in several variant forms, and was in use as both an infantry weapon and as an artillery piece. In this latter form, installed on mountings on castle walls like the Roman ballista, crossbows appear to have been formidable weapons, highly prized by generals. The presence of an ?yumi at a Tsushima watchtower seems to have been such a grand prospect that the weapon’s name was eventually assigned to the town where it was based. However, the ?yumi is also something of a mystery. When they were commonplace, nobody thought to draw them or describe their construction – ?yumi were simply used in battles and regularly reported to devastate enemy lines. If they came into Japanese hands during the Korean wars, their intricate manufacture and maintenance was only sustainable for a few generations. As the Korean and Chinese military advisers faded into the local population, the number of competent operators or mechanics dropped off. By the ninth century, ?yumi were still reported in district armouries, but rarely mentioned on the battlefield. Instead, district commanders griped about the cost of maintenance, or filed plaintive reports with the court, requesting instructors be sent to teach their men how to use the legendary weapons. The weapons show up in Tsushima, close to the mainland, and also in border forts in the wilder frontier of the northeast – yet even there they appear to have swiftly degraded, their triggers jamming or sights left uncalibrated. Whatever an ?yumi was, its delicate mechanism, expensive springs and bowstrings became harder to replace. By 914, a general described the few remaining crossbows as ‘empty nostalgia’, gathering dust in local armouries, entirely beyond the comprehension of local troops. A few large-scale versions persevered in northern forts, but no extant examples survive for modern investigators to assess. It probably did not help the crossbow’s fortune that it seemed primarily designed for defence rather than attack, in an age when relatively few battles on Japanese soil were fought under siege conditions. As decades passed with no sign of the much-awaited invaders, the crossbows fell into disrepair. Nor should we discount the influence of a form of martial snobbery among the Japanese. The acceptable face of martial valour, throughout the history of the samurai, required great achievements in swordsmanship and archery – both skills that required long years of training. The crossbow, like the arquebus many centuries later, may have been seen as an unwelcome equalizer, operable by any conscript, but sufficient to turn such a man into the nemesis of any samurai standing in his line of sight. There is an intriguing class-based dilemma about the fate of the crossbow – it required a skilled artisan to manufacture, and the wealth of an aristocrat to maintain, but was liable to be crewed by lowly border guards. Despite its high-tech allure, it seems to have been shunned by the samurai, who saw no glamour or glory in its use. My latest book, out now in the UK, and coming in May in the US — everything you always wanted to know about the samurai, but were too afraid of ritual disembowelment to ask. The samurai were the embodiment of the Japanese martial tradition. From humble beginnings as frontiersmen and border guards, they rose in power to become the true rulers of Japan, with an ideology based on military strategy and chilling battlefield aesthetics. This new study includes their greatest battles and worst defeats, their wars and weaponry, tradition and etiquette, and their transformation from hired swords to kingmakers, from Buddhist warlords to Christian soldiers. 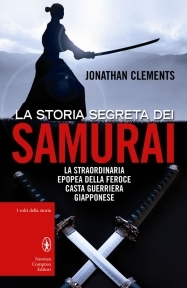 Jonathan Clements examines samurai facts and fictions, as a warrior society retells great battles, dramatises heroic deeds, and aspires to a code of ethics rooted in tall tales and romanticised conflict. 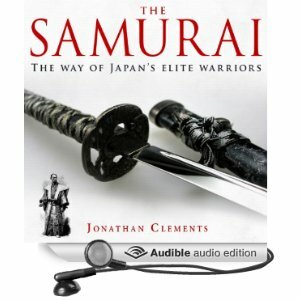 Looking beyond the end of Japan’s civil wars in the 17th century, this Brief History depicts the rise and fall of a samurai society in which the victorious Shogun had nobody left to fight. A closing chapter examines the shadow of the samurai in modern times, as heroes, villains, and mirrors to the Japanese soul.